Lots of new batteries (for mobile devices, MP3 players, etc) have connectors with 3 pins. I would like to know what is the purpose of this and how should I use these three pins? They are usually marked as (+) plus, (-) minus, and T.
The third pin is usually for an internal temperature sensor, to ensure safety during charging. Cheap knock-off batteries sometimes have a dummy sensor that returns a "temp OK" value regardless of actual temperature. Some higher-end batteries have internal intelligence for charge control and status monitoring, in which case the third pin is for communications. 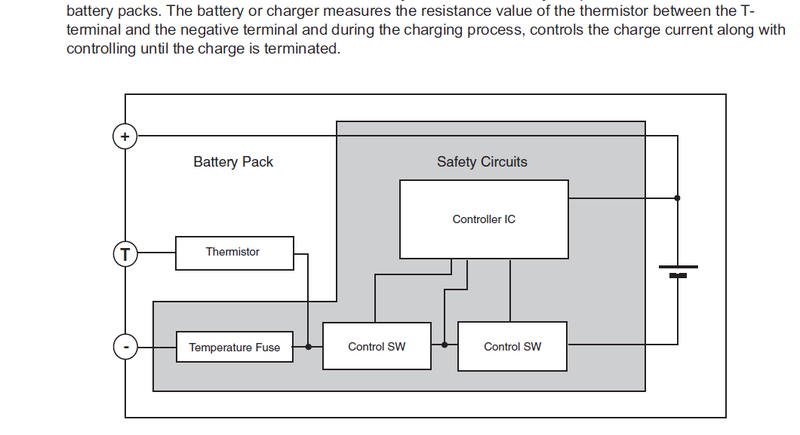 That third contact is connected to an internal thermistor, enabling the charger to measure the battery temperature. positive, negative, 1-wire bus. The latter is a digital communication bus that’s connected to a gas gauge IC inside the pack. If you want to explore what’s inside single-cell Li+ battery packs, look-up bq27000 gas gauge IC and associated application notes. Could be a good starting point. Some packs have 4 terminals: positive, negative, SDA, SCL. The latter 2 lines are I2C or SMBus. Look up the bq27200 gas gauge IC (shares datasheet with bq27000). EDIT: This was written as an answer to a duplicate question, which got merged with this one. The third pin is usually found on Li-Poly, or Lithium Polymer batteries and is required in order to charge the battery safely. Because these batteries are usually multi-cell, the third pin is used for balancing the charge between each of the cells. Not the answer you're looking for? Browse other questions tagged batteries battery-charging pins or ask your own question. Why does this mobile phone battery have 4 terminals? Do cells phones put out a signal when charged through data out? How to keep rarely-used Li-Ion batteries functional? What type of batteries are these? What are these kinds of pins called? How to automatically assemble lithium polymer battery?